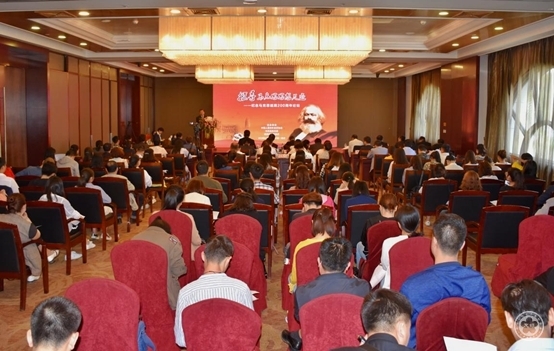 On May 14th, Vice President Xie Yuan attended the forum ‘Exploring Marx’s Thoughts—Marking the 200th Anniversary of Marx’s Birth’ in Yan'an, Shaanxi Province. The forum was co-held by the Chinese People’s Association for Friendship with Foreign Countries, Yan'an Municipal Committee of CPC and the People’s Government of Yan'an. It is of great significance to summarize the journey of the exploration of Marx’s thoughts in Europe and to promote the localization, modernization and popularization of Marxism in China. The forum was divided into three sessions, i.e., Marxism and Human Development, Reform and Opening-up and the Localization of Marxism, and Marxism and Youth’s Mission. Yan Hanping, deputy secretary of Yan'an Municipal Committee of CPC, Zhang Maizeng, party secretary of Xi'an Jiaotong University, Yang Zhihe, director of the Academic Affairs Department of China Executive Leadership Academy of Yan'an, Xie Yuan, Vice President of CPAFFC were invited and delivered keynote speeches. Deputy secretary Yan Hanping stated that Yan'an is an important place for the localization of Marxism. The three great leaps taken place in China were all related to Yan'an. In the future, Yan'an will continue to develop with the Yan'an spirit. Party secretary Zhang Maizeng pointed out Marx is a thoughtful, innovative and diligent figure. His thoughts are people-centered and practice-oriented. It is of profound historical and practical significance to explore why China had chosen Marxism. Vice president Xie Yuan spoke highly of the signing of the memorandum between Yan'an and Trier to establish a friendship-city relation. He recommended Yan'an to invite the mayor of Trier to visit Yan'an as soon as possible and promote practical cooperation between the two cities, especially strengthen exchanges and interactions among the youth. The forum also invited professors from Central Party History Research Institute, Renmin University of China, China Foreign Affairs University, Beijing Normal University, China Executive Leadership Academy of Yan'an, Party History Research Office of Yan'an and Yan'an University to jointly discuss the understanding of Marxism and its localization in China. Meanwhile, PhD. candidates from China, Germany, Kazakhstan, Vietnam, Laos and Nepal participated in the forum to share their views.